Prior to the automobile age, what became US-112 was originally the Sauk Trail (sometimes noted as the Great Sauk Trail), a path through the wilderness trodden by countless Native Americans over the centuries. Once European settlement of the Lower Great Lakes region began, settlers found the Sauk Trail was the best route between the settlement at Detroit and the southern end of Lake Michigan and onward toward Fort Dearborn at the site of present-day Chicago. Conversion of the Sauk Trail to a wagon road began in earnest in 1829 and was completed in 1836. It cost $87,000 at the time (anywhere from $2.1 million to $1.1 billion in today's money) and remained an important stagecoach route into the 20th Century. 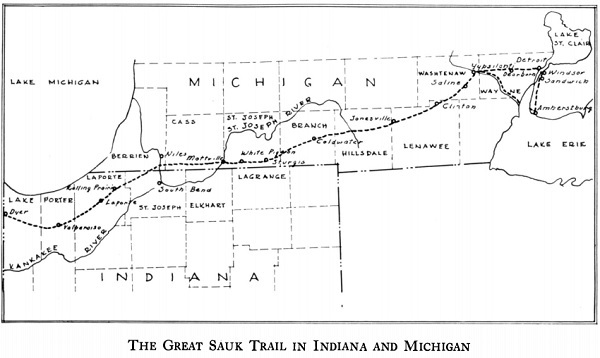 The Sauk Trail later became known by many names, mostly relating to its destination: Chicago Road, Chicago Turnpike, Chicago Pike, etc. It was a natural route for inclusion in the State Trunkline Highway system and was made the fourteenth trunkline route and given the designation Trunk Line 23. When the State Highway Department began signing its routes in the field in 1919, M-23 route markers were placed along its route, which began in Detroit and continued west-southwesterly through Ypsilanti, Saline, the Irish Hills, Jonesville, Coldwater, and Sturgis, terminating west of White Pigeon. M-23 was later extended westerly into Cass Co where it ended at the Indiana State Line near Allenton. Less than a decade later, when the Bureau of Public Roads and the American Association of State Highway Officials (AASHO) conceived of the U.S. Highway System, the Sauk Trail/Chicago Road route was included in that new network of highways. However, the route was not destined to receive a primary mainline designation. US-12 was designated along the "Territorial Road" corridor from Detroit through Ann Arbor, Jackson, Battle Creek, and Kalamazoo before turning southwesterly at Benton Harbor/Saint Joseph to head along Lake Michigan into Indiana and on toward Chicago. To the south, US-20 ran along the important Toledo–South Bend–Chicago route. 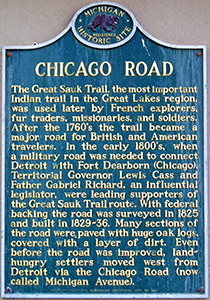 Instead, highway officials agreed on the US-112 designation for the historic Sauk Trail, intending for it to be an alternate to the primary Detroit–Chicago route of US-12. Through traffic between Detroit and Chicago would travel along US-112 for most of the distance then transition to US-20 between Elkhart, Indiana and Chicago. In the 1930s, however, traffic along the route increased substantially and within a decade after its debut, US-112 was extended westerly through Niles to a new western terminus at its "parent" route, US-12, near New Buffalo. Many long-distance travellers found the US-112 route between Detroit and Chicago preferable, as it was a few miles shorter and avoided many of the larger cities found along the US-12 alignment. While it was clear the initial choice for the route of the proposed Detroit–Chicago Expressway (now I-94) was to build it using the US-12 corridor, plans were soon developed in the late 1950s to convert all of US-112 between Metro Detroit and New Buffalo to a fully limited-access freeway as well. Portions of the "Niles Bypass" and a never-completed full cloverleaf interchange along M-52 between Manchester and Clinton are all that remain of those early plans. By the time the "Detroit–Chicago Expressway" was nearing completion, and now signed as part of I-94 between Port Huron and Miles City, Montana by way of Chicago, Milwaukee and Minneapolis/St. Paul, the State Highway Department felt the need to remove the duplicative US-12 designation from that route and US-112 began and ended at US-12 on either end of the state, the decision was made to transfer the US-12 mainline route over to replace US-112 in 1962 and, thereby, relegating US-112 to the history books. In the end, US-112 only existed for about 35 years. NOTE: A separate route designated M-112 ran between Detroit and Ypsilanti, existing from 1941–1956, traversing the Willow Run and Detroit Industrial Expressways. Please see the M-112 and I-94 route listings for full details on that historic route. 9999X9999X US-112 is commissioned, at the same time as the rest of the US Highway System, linking downtown Detroit with Elkhart, Indiana, generally following the present-day US-12 corridor. The entirety of M-23 from the Indiana state line near Allenton in southern Cass Co (north of Elkhart, Indiana) and downtown Ypsilanti and the portion of M-17 between downtown Ypsilanti and downtown Detroit is redesignated as the route for the new US-112. (May 15) The new US Highway designations across the state of Michigan officially become effective today, with US-112, as noted above, superceeding the entire route of M-23 and the portion of M-17 between Ypsilanti and Detroit. (July 11) The Detroit City Council approves the request made jointly by Grover C Dillman, State Highway Dept engineer, and John W Reid, commissioner of public works, to erect route markers on the various streets in downtown Detroit carrying the new U.S. Highway routes. US-112 is to be marked along Michigan Ave from the western limits of Detroit easterly into downtown, terminating at City Hall. Coldwater: The 1.5 miles of Chicago St through the City of Coldwater in Branch Co from a point between Pearl and Jay Sts on the west side of the city easterly through downtown to Wright St on the east side of town. Ypsilanti: The 1.2 miles of Michigan Ave through the City of Ypsilanti in Washtenaw Co from the cnr of Congress St & Ballard St easterly through downtown to the east city limit approximately 0.14 mile east of jct M-17/Ecorse Rd. Dearborn–Detroit: The 0.6 mile portion of US-112/Michigan Ave in Dearborn from Oakwood Blvd easterly to Wyoming Ave on the Detroit city limit and the 5.5-mile long segment of US-112/Michigan Ave within the City of Detroit from Wyoming Ave easterly to its terminus at Woodward Ave in downtown Detroit are both assumed into the state trunkline highway system. 1931 Beginning in 1931, a new state trunkline route is shown as running from US-112 at Allenton in south-central Cass Co westerly through Adamsville and Edwardsburg and into Niles largely along the present-day route of US-12. This new trunkline is shown on maps as M-151, although it is only a "Marked & Maintained" route, as no state trunkline determinations or jurisdictional transfers have occured along that route at this point. 1932 In an intriguing move, the portion of US-112 from Five Points or Allenton in southern Cass Co southerly into Indiana is redesignated as US-112S, as in "US-112 SOUTH"—a south "branch" of US-112—presumably as a differentiation from a potential US-112N routing. Coming about the same time as the new state trunkline routing between Allenton/Five Points and Niles is officially determined, it would seem to indicate the State Highway Dept intends to extend the route of US-112 in Michigan westerly through Niles to its "parent" route, US-12, near New Buffalo. The US-112S designation is mentioned in Indiana news reports as early as March 1932. May 26) A new 14.3-mile long state trunkline route is officially determined in Cass Co on May 24 beginning at US-112 in Allenton in southwestern Mason Twp ½ mile north of the Indiana state line and running generally westerly toward Niles. Parts of the new trunkline route run along existing county roads, while other parts are unconstructed. From Allenton (at the cnr of Old M-205, Redfield St & Cassopolis Rd), the new trunkline route heads northwesterly to a point south of Adamsville, then continues westerly along May Rd bypassing Edwardsville to the south to the intersection of M-151 (present-day US-12) & Fir Rd, then turns northwesterly to Worrell & Sturges Rds before continuing westerly along Worrell Rd to present-day US-12, then northwesterly along M-151 (present-day US-12) to the Berrien/Cass Co line. Two days layer on May 26, the 1.3 miles of Main St at Niles (currently "Marked & Maintained" as M-151 since 1931) from the Berrien/Cass Co line northwesterly to jct US-31/Eleventh St & M-60/Oak St in Niles is officially assumed into the trunkline system as part of the same route. Presumably, this determination is meant to be the permanent route for M-151 with the existing "Marked & Maintained" route to be retained until the permanent one is constructed and opened to traffic. 1934 (April) Civic leaders in Coldwater, lead by attorney Wade Mills, begin courting others along the route of US-112 in an effort to rename the route "The Lewis Cass Highway" along its course from Detroit into Cass County as a memorial to the territorial governor of Michigan. Organizers note the history of the route, which also saw famous 19th century figures such as Daniel Webster and James Fenimore Cooper travelling along it. 1934 (June) The American Association of State Highway Officials (AASHO) approves the rerouting of US-112 on its western end. From the southerly turn at Five Points in southern Cass Co, US-112 is approved to continue westerly along M-151 to Niles, then concurrently with M-60 to a new western terminus at US-12 near New Buffalo. Existing US-112 from Five Points southerly into Indiana is to redesignated with state route numbers. (Jan 7) Just 19 months after being determined as a new state trunkline routing across southwestern Cass Co, the 14.3-mile route between Allenton and the Berrien/Cass Co line assumed into the system on May 24, 1933 is cancelled as a trunkline routing. Simultaneously, however, the existing 15.8-mile long route of M-151 is officially assumed into the system, running along the present-day path of US-12 between Five Points (1¼ mile east of Allenton at the present-day cnr of US-12, Old M-205 & Five Points Rd) through Adamsville and Edwardsburg to the Berrien/Cass Co line southeast of Niles. Only the portion of the route between Worrell Rd and the Berrien Co line is shared with the cancelled "permanent" route from 1933. 1935 (Sept) Eight months after the existing "Marked & Maintained" alignment of M-151 between Five Points and Niles was officially assumed into the state trunkline highway system, it is redesignated as a westerly extension of US-112 in Michigan. At Niles, US-112 is added as a concurrent designation to the existing M-60 routing from Niles westerly to US-12 just north of New Buffalo. The former route of US-112/US-112S from Five Points to Allenton then southerly to the Indiana state line is redesignated as M-205. The length of US-112 loses 1¾ miles (M-205) while 43.1 miles is added, for a net gain of 41.37 route miles. The M-151 designation is removed from the Five Points–Niles route and immediately transferred to a brand new state trunkline routing in southern Monroe Co. The US-112S designation in both Michigan and Indiana seems to fade into history at this time as well. (June 2 ) US-112 across its entire length becomes the launching ground for the installation of uniform traffic signs through the entire state of Michigan. While the improved and standardized signage will eventually be installed on all state highways, county roads and city streets statewide, the five-year program begins with US-112. Authorized by the state legislature in 1937, the new uniform signing program includes five major changes: larger stop signs (twice the surface area as before), curve signs with arrows indicating four degrees of sharpness, larger route markers on city streets posted higher to be seen above parked cars, distance and direction signs posted facing approaching traffic ahead of intersections instead of parallel to it at the intersection, and less frequent pavement markings. The last comprehensive signage upgrade along the roads and highways in Michigan was during 1924. 1939 (Fall) US-112 in Michigan is now hard-surfaced in its entirety when the last gravel portion between M-205 in Cass Co and Niles in Berrien Co (the former M-151 segment) is paved. (Nov 12) A new 0.596-mile long segment of US-112 on the west side of Coldwater in Branch Co is officially assumed into the state trunkline highway system. This new alignment replaces a more meandering alignment through Oak Grove Cemetery and also includes a new bridge spanning the Coldwater River. The former route is partially obliterated or abandoned and partly subsumed under a portion of the new alignment, with the remainder turned back to local control being incorporated into Willow Ln and Old US-112. (Jan 28) A 2.266-mile segment of highway beginning at US-112/Michigan Ave just east of the Washtewnaw/Wayne Co line east of Ypsilanti and heading southwesterly to M-17/Ecorse Rd, then west-southwesterly to the present-day jct of US-12 & M-17 is officially determined as a state trunkline highway route as part of the overall Willow Run Expressway System, serving the Willow Run Bomber Plant being constructed by Henry Ford to produce bombers for World War I. A portion of this new route replaces a parallel segment of M-17, however the connector between M-17 and US-112/Michigan Ave east of Ypsilanti does not seem to have a route designation at this time. (Feb 23) A new 1.477-mile long segment of US-112 is officially determined as a state trunkline highway route in Branch Co southwest of Bronson from just west of Bawden Rd southwesterly to 0.35 mile west of Holmes Rd. Four curves in the old alignment are now replaced with one gentle curve. The former 1.5-mile long route along Weaver Rd is turned back to county control. Sept 22) – On Sept 12, the east tri-level ("triple decker") interchange on the Willow Run Expwy is dedicated and opened to traffic. This interchange allows traffic from the future BYP US-112 (later US-112, now US-12) section of the Willow Run Expwy to directly access the Willow Run bomber plant from the north. Then on Sept 22, news accounts report the entire Willow Run Expressway System is "put into service," implying the entire expressway along Chase Rd from Hannan Rd westerly to Wiard Rd, northerly along Wiard Rd from Chase Rd to M-17/Ecorse Rd, then easterly along M-17/Ecorse Rd to M-56/Belleville Rd, with extensions to the northeast connecting with US-112/Michigan Ave and to the west connecting with M-17/Ecorse Rd heading into Ypsilanti. (Apr 20) A crucial link in the Willow Run Expressway system is opened to traffic, linking M-17/Ecorse Rd just east of the East tri-level interchange with exisitng US-112/Michigan Ave just west of Denton Rd in western Wayne Co. This new one mile segment of six-lane divided expressway not only allows US-112/Michigan Ave traffic to now have direct access to the northern entrance to the Willow Run bomber plant, but also marks another step toward the completion of the future BYP US-112 around Ypsilanti as well. Construction on the remainder of the "Ypsilanti bypass" continues. (Early) A 6.1-mile long westerly extension of the Willow Run Expressway System from M-17 (at the present-day jct of M-17/Ecorse Rd & US-12 southeast of Ypsilanti), bypassing Ypsilanti to the south and westerly toward Ann Arbor is officially determined as a state trunkline highway route in August 1942 is completed and opened to traffic. While this new highway is designated as M-17 throughout, a new BYP US-112 designation is created to also bypass Ypsilanti as well. The new BYP US-112 begins at existing US-112/Michigan Ave just east of the Washtenaw/Wayne Co line and continues southwesterly to meet M-17/Ecorse Rd north of the bomber plant, then runs concurrently with M-17 southwesterly and then westerly, bypassing the city of Ypsilanti to the south. BYP US-112 terminates at US-112/Michigan Ave where the two routes meet again southwest of the city, while M-17 continues to the west along the bypass toward US-23/Carpenter Rd farther west. Existing US-112 along Michigan Ave through Ypsilanti continues to exist as-is. (June 25) Two sharper turns along US-112/Michigan Ave in western Wayne Co are replaced by more gentle, sweeping curves. The new segments of state trunkline highway total 1.0 mile even, while the bypassed segments total 1.2 miles, for a total savings of 0.2 mile over the former alignment. The first realignment centers on the Haggery Rd intersection in southeastern Canton Twp with ¼ mile of new US-112 on either side of Haggerty Rd. The former alignment is obiterated and vacated west of Haggerty, while the segment east of Haggerty is turned back to local control and named Old Michigan Ave. The second realignment west of downtown Wayne in Wayne Twp is centered approximately between John Hix Rd and Newburgh Rd with the former alignment being obliterated and vacated. (Dec 1) A 2.675-mile segment of US-112 on new alignment running along present-day US-12 in Porter Twp in southeastern Cass Co is completed and opened to traffic. The new highway alignment begins at Birch Rd and continues easterly just west of Suszek Rd and removes several sharper turns in the route in that area. Portions of the former route of US-112 are subsumed underneath the new alignment, while other segments are obliterated or abandoned, with additional segments, now named "Old 112," scheduled to be turned back to county control. (Nov 10) The new 2.675-mile segment of US-112 completed and opened to traffic in southeastern Cass Co's Porter Twp the previous December is officially determined as a state trunkline highway, with the former 2.7-mile segment being cancelled. The segments of "Old 112" which remain from the former alignment have now been turned back to county control. (Mar 30) Governor G. Mennen Williams signs a bill designating the entirety of US-112 from New Buffalo to Detroit the "Pulaski Memorial Highway," after General Casimer Pulaski, a Polish nobleman, soldier and military commander who has been referred to as "the father of the American cavalry". The bill was sponsored in the legislature by Reps. Stanley Novak and T. John Lesinski, both of Detroit. 1954 (Nov) The four-lane bridge spanning the Saint Joseph River south of Niles which will become part of the US-112/M-60 "Niles Bypass" is completed, although it will not open to traffic until the bridge approaches and other portions of the new bypass route are completed. (Nov 1) The State Highway Dept makes several major route designation changes in the metropolitan Detroit/Ann Arbor area involving the Willow Run, Detroit Industrial and Edsel Ford Expressways. US-12, which had an eastern terminus at US-16 at the cnr of Plymouth Rd & Grand River Ave on Detroit's westside since it was first designated in 1926, then later concurrently designated with US-16 along Grand River from Plymouth Rd southeasterly into downtown Detroit, is relocated from the Plymouth Rd alignment between Ann Arbor and Detroit and transferred to a new southerly route. Beginning at the western end of the "Ann Arbor Southbelt," US-12 now runs southeasterly and easterly around Ann Arbor to US-23/Carpenter Rd, then continues easterly supplanting the M-17 designation along the Ypsilanti bypass to US-112/Michigan Ave. From there, the BYP US-112 designation on the Ypsilanti bypass is replaced by the mainline US-112 designation and concurrently designated with US-12. (M-17 is removed from the bypass routing and replaces the BUS M-17 route through downtown Ypsilanti while US-112 through the city is redesignated as BUS US-112.) US-12/US-112 continues easterly onto the Willow Run Expwy to the west tri-level interchange where US-112 continues northeasterly via the former BYP US-112 back to Michigan Ave east of Ypsilanti while US-12 turns southerly along the Wiard Rd alignment of the Willow Run Expwy supplanting the M-112 designation before turning easterly again along the Chase Rd alignment of the Willow Run, heading into Wayne Co. As a result of these route changes, US-12 and its "child" route, US-112, now run concurrently for the first time. 1956 (Sept) The first 3.3 miles of the US-112/M-60 "Niles Bypass" around the south side of Niles in southeastern Berrien Co is completed and opened to traffic. The bypass is completed from Chicago Rd near Portage Rd southwest of Niles and continues easterly to an interchange with US-31/US-33 at S 11th St. Through US-112 and M-60 traffic is routed northerly from the temporary eastern end of the bypass via US-31/US-33/S 11th St back into Niles to the existing routes of M-60 (along Oak St) and US-112 (along E Main St). The former route of US-112/M-60 into Niles from the west along Main St, Lincoln Ave (including the St Joseph St–Grant St one-way couplet) and Chicago Rd is redesignated as BUS US-112/BUS M-60. 1956 (Nov) The remainder of the US-112/M-60 "Niles Bypass" around the southeastern side of Niles in southeastern Berrien and southwestern Cass Counties is completed and opened to traffic. This completes the entirety of the Niles Bypass after the first three miles were completed and opened to traffic in September. From the US-31/US-33 interchange south of Niles, the US-112/M-60 bypass continues easterly and northeasterly into Cass Co to an at-grade intersection with existing US-112, which continues easterly toward Edwardsburg. Tbe bypass continues northeasterly as just M-60 back to the existing M-60 at Yankee St east of Niles. The remainder of the former routes of US-112 (along E Main St) and M-60 (along Oak St–Yankee St) are designated as parts of the BUS US-112 and BUS M-60 routes, respectively. (June 24) The 6.287-mile long "Niles Bypass" around the City of Niles in southeastern Berrien and southwestern Cass Counties is officially determined as a state trunkline route, although the lion's share of it—including the entire portion designated as US-112—was opened to traffic the previous September and November. 1958 (Oct) The State Highway Dept orders a flashing beacon ("blinker light") installed at the at-grade jct of US-112 & M-60 southeast of Niles at the newly-completed Niles Bypass due to the occurrence of numerous automobile accidents at the intersection since the opening of the bypass. Three persons died and 77 were injured in collisions at the intersection in 1957–58 and is rated as the most dangerous on the entire 9,300-mile state trunkline system in 1958. The State Highway Dept designs a fully grade-separated interchange at the junction in 1958, put it out for bids on October 7, with completion set for October 31, 1960. (Sept 2) The partial cloverleaf interchange at jct US-112 & M-60 southeast of Niles replacing what had been the most dangerous intersection on the state trunkline system (two years running!) is completed and opened to traffic. (Jan 8) In a major route designation reconfiguration, the route of US-12 in Michigan is drastically altered: After traversing the Detroit–Ann Arbor–Jackson–Battle Creek–Kalamazoo–Benton Harbor/St Joseph–New Buffalo corridor for 36 years and being gradually transitioned onto the Detroit–Chicago Expressway and, later, I-94, Michigan State Highway Dept officials remove the US-12 designation from its existing route between Detroit and New Buffalo and redesignate the entire length of US-112 between those same two points as a new routing for US-12. This affects 98% of the route of US-12 in Michigan (approximately 215 of 219 miles) and results in the decommissioning of the US-112 designation. The former BUS US-112 routes through Niles and Ypsilanti are redesignated as BUS US-12 routings in each city. According to site contributor Ron Willbanks, instead of erecting all new "US-12" route markers along the former route of US-112, the State Highway Dept instead blocks out the first "1" on the sign, leaving only an off-center "12" on the highway shields between New Buffalo and Detroit. Over time as the signs need replacement, they will be replaced by "real" US-12 route markers. (—Thanks Ron for the information!) Thus, after itself having existed for about 35 years, US-112 fades into history. End of US highway 112 - from Dale Sanderson's excellent US Ends website. U.S. 12: Michigan to Washington - by the FHWA's Richard F. Weingroff, part of the administration's Infrastructure series of articles. Historic US-112/112S/Historic Indiana 112 - from the Indiana Ends website. US-112 - from another Indiana Highway Ends website.